I’m a wild foods educator. I started a little over twenty years ago, the year I came to Asheville. My specialty is wild mushrooms. When I teach about foraging, I tell people, don’t ever go mushroom hunting. Why? Because when you forage, it’s very easy to find what you’re not looking for. Foragers can’t be choosers. You never know what you might find, and that’s the fun of it. When you choose to forage, you not only accept but appreciate diversity. When people ask me why I moved to Asheville, I sometimes say: failure. I had spent five years looking for the right community and I never found it. I gave up and joined a couple friends in an old farmhouse outside of Asheville paying $65 a month. I didn’t have a job, nor did I want one. I fed myself by foraging instead. Eventually, I started selling to restaurants and began teaching others as well. I moved to Asheville not because I had found the “right” place to live, but because I gave up on searching for it. Like the “ash” in Asheville, I was burnt out. I didn’t know what was next. I didn’t realize I had landed in the very best place in the world I could be for what would end up being my career. I came to Asheville, like many people do, to figure out what’s next, to heal, to find myself. What I found in Asheville is that it’s very easy to lose yourself. Quite literally, I would drive around and get lost. Trying to get around Asheville is like foraging: it’s easy to find what you’re not looking for. There’s a reason for this, and it turns out to be the same reason Asheville is, in fact, so perfect for me and so special. 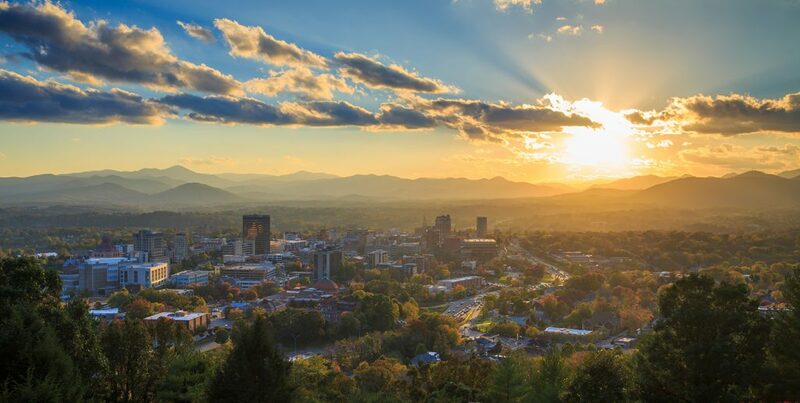 Asheville is known for its diversity of beers, restaurants, music, arts and crafts, healing artists… you name it. But what I learned only a few years ago is that Asheville also has the greatest biodiversity outside of the tropics in the Western Hemisphere. Our PR department has dubbed Asheville Foodtopia. To me, it means more than marketing. We have more wild food here year-round than anywhere, outside of the tropics, on earth. There are at least 300 wild edibles in our bioregion, at least half of which are quite common. It’s hard to imagine how anyone could go hungry in Asheville. But they do, just like everywhere else in the modern world. And in my opinion, it is for lack of respect for diversity. It’s a narrow-mindedness that our whole culture shares. We eat only certain foods, so we only grow certain crops. That’s not sustainable, but we try anyway. Fortunately, we’re rediscovering this Garden of Eden, especially here in Asheville. People have always come here for healing: for coming back from the ashes, so to speak. There’s a reason for that too. And the healing comes from realizing that all this cultural diversity is rooted in our biodiversity. And that traces back to the land, the reason why it’s so easy to get lost here. Asheville is not a big flat field that you can fill up with straight streets, a bunch of cookie-cutter houses, or corn and soybeans. It is full of nooks and crannies. These make for a variety of microclimates. These also make for great places to hide out and do your own thing. What’s true for plants is true for humans. That’s why the Scotch-Irish, the first whites to settle here, chose this region, then the moon-shiners, then the hippies and the DIYers after them. It’s why so many of the old homesites here are way up in the hollers, in some of the most inaccessible places, not down in the valley right on the road. You would have to be either very crazy or very independent to choose to build up there. But think about it: why does an orchid “choose,” so to speak, to only be pollinated by a certain insect? It’s like marriage. That degree of specialization is the kind of diversity that Western North Carolina enjoys, from the ground up. We don’t want a monoculture, either of plants or of people. That’s why we’re here. I didn’t realize this when I came here, but it’s the reason I’m staying.